Having a fast-growing business is good. Having to overhaul your technology every time you need to scale is not. Upgrading to a more complete Enterprise Resource Planning (ERP) solution can help, but how do you ensure the solution you choose is exactly what you need? • What features are included and how many contracts do I need to sign? • Is this the actual price or just a short-term promotion? • Are you equipped to handle domestic and international growth? 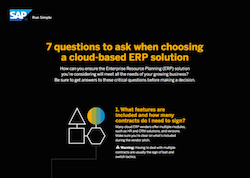 For the full list of questions and critical warning signs, download our “7 Key ERP Questions” infographic today.